As you probably already know, Pro-Action has always built custom racing suspension systems for all of our customers. With these new custom valving kits we are offering, comes the results of the research we have conducted and compiled throughout our testing over the past twenty years. We have incorporated these results into the valve stacks that you find in these kits. These stacks have worked the best for us on each of our different valve bodies for the highest percentage of our riders the highest percentage of the time. These settings will make the majority of our customers extremely happy if you use these custom valving stacks with the correct spring rates. Although the valving is very important so are the springs. For many years we have preached that "you can't valve around the wrong springs nor can you spring around the wrong valves." It just won't work. They are made to work together. If you have any questions or you would like to have us build you a custom suspension system please don't hesitate to contact us here at Pro-Action or your nearest Authorized Pro-Action franchise location. 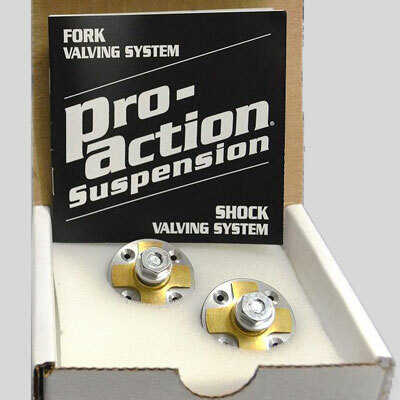 When installing the Pro-Action valving kits please recognize that these kits have been designed for people who already have been performing work on suspension components and have the necessary knowledge and tools. We have been installing these kits for over twenty years with a customer dissatisfaction rate of less than one quarter of one percent. Almost a perfect track record. 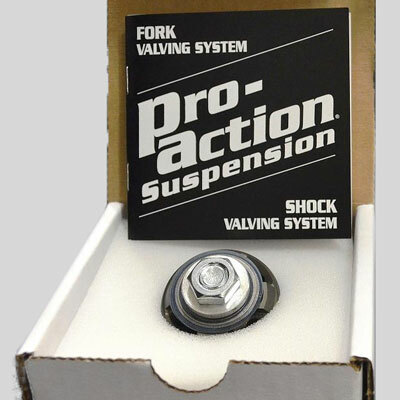 If you are about to install one of the Pro-Action valving kits be sure that you have the mechanical skill, and proper tools to perform the installation. We know the system works. If you have any doubt about your qualifications to competently work on your own suspension components please call Pro-Action or one of our factory-trained franchise locations to install the kit for you. Although the kits are tested and proven to work flawlessly, incorrect installation can cause the components to malfunction and could cause serious injury or even death. Always remember that motorcycle racing and riding is a dangerous activity. Pro-Action assumes no liability for any damage that may arise either physically or mechanically due to a faulty installation performed by the customer. If you are doing an installation for the first time you may find it difficult due to lack of recognition of some of the components described in the instructions. if you are having a problem or have questions please don't hesitate to call Pro-Action or the authorized and factory trained Pro-Action franchise from whom the kit was purchased. We will be happy to give you the exact settings on oil weights, volumes, nitrogen pressures, clicker settings, and spring rates or answer any other questions you might have!